Works to repair, strengthen and improve flood banks at Slippery Gowt - which were damaged in the 2013 tidal surge - are now complete. Improvements to a Boston Haven flood defence damaged during the December 2013 tidal surge are now finished, meaning the banks at Slippery Gowt are stronger than ever before. The improved defence will help reduce the risk of flooding to more than 500 homes and businesses including the Haven Business Park. The repairs and improvements to the Slippery Gowt flood bank means it can continue to reduce flood risk to people living and working in the area for many years. Although flood banks help reduce the risk of flooding, it’s still important for people to realise that flooding cannot always be prevented – but you can further reduce your risk by signing up for free flood warnings from the Environment Agency. 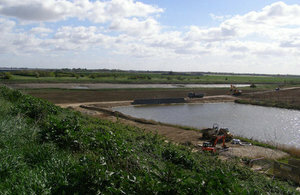 Work on the bank began in 2013, when repairs were made to plug a 45m gap caused by high tides combined with the tidal surge, meaning water overtopped the banks and eroded the soft silt beneath. The £500,000 reconstruction work, which was undertaken in partnership with FCC Environment, was completed in April. To further reduce your risk of flooding, sign up for free flood warnings by calling 0345 988 1188 or visiting our Flood Warnings Direct page.